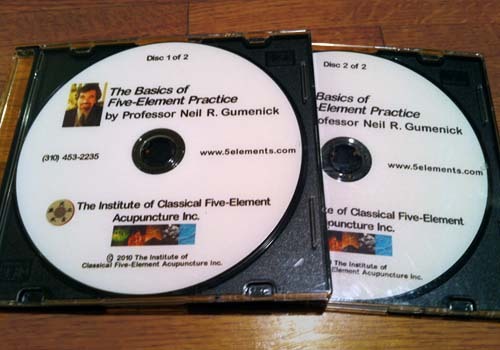 This two-disc DVD features Professor Neil Gumenick live at the Five Element Acupuncture Symposium: Continuing the Journey™ in October 2009. In this video, Neil covers the Law of Five Elements, including the Sheng (generating) and K'e (controlling) cycles, with examples of how these can be seen in human psychology. He explains the protocols for detecting and clearing energetic blocks, some of which can be fatal, others which, unless removed, will hinder or prevent any treatment from being effective. These include Possession, Aggressive Energy, the Husband/Wife Imbalance, balancing the Umbilical Pulse and Akabani (left/right) meridial imbalances, Entry and Exit Blocks, including CV (Ren) and GV (Du) Blocks, and the Spirit Level Block. This DVD set is appropriate for practitioners of any style of practice. For information on ordering the DVD or Audio CD set by phone, please call 310-453-2235.